This craft sticks rainbow craft was completely inspired by supplies we had on hand. As I was pulling craft sticks from our crafting box to make craft sticks Leprechaun hats, I spied the rainbow craft sticks used in this craft project and was immediately drawn to all the bright colors and knew a rainbow craft was in our near future. As we were gluing our craft sticks together to form our rainbow craft, I started searching for our cotton balls to make a cloud only to turn up empty handed. Luckily, I had cotton pads (cotton rounds). Yup, the ones you use to take make-up off. Turns out they work great for clouds too. We used colored craft sticks. If you use natural craft sticks, you will also need paint. 1. 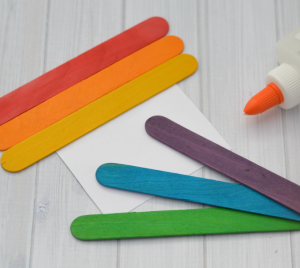 If you using natural craft sticks begin this rainbow craft by painting your craft sticks and allowing them to dry. 2. Cut a small piece of cardstock (fiberboard would work as well). The purpose of the cardstock is a base to glue the craft sticks. 3. Glue the card sticks to the piece of cardstock starting with red and ending with purple. 4. Glue a few cotton pads (or cotton balls) together to form a cloud.